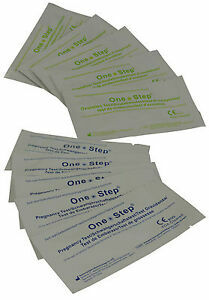 Find out if you will be expecting with the fertility testing kit from One Step. The fertility test kit comes with thirty ovulation test strips and five pregnancy test strips. They are all individually packaged so you can keep them handy even when travelling. The easy-to-use urine test strips will show your result in just a few minutes from initial application. Économisez 50 % sur les frais de livraison pour chaque objet admissible supplémentaire acheté auprès de klackstar. 74.834 objets sont disponibles. Saisissez un chiffre inférieur ou égal à 74.834.